Apple’s patented fingerprint identity sensor labelled as Touch ID is deemed among the smart features entrenched into the iPhone and iPad Home button (later versions). It also integrated into the MacBook Pro’s Touch Bar sensor. It is one of the iDevice unlock systems that identifies and allows authorize access. Aside from unlocking the iPhone, the Touch ID system is also used to authorize purchases, provides access to password and banking apps. It is considered an additional layer of security (biometric system) that is meant to be more convenient than a passcode or password. For those who are new to iOS and needs to know more details on how Touch ID works on their new iPhone 7, this content should serve as a free reference. This post highlights a quick overview on how Touch ID works, how to manage Touch ID settings, and what to do if Touch ID doesn’t work as intended on the iPhone 7. Read on to learn how to setup and use Touch ID on your new iOS device. How does Touch ID work on your iPhone 7? New models of iPad and iPhone devices integrate a capacitive Touch ID sensor in the Home button. To detect your finger or fingerprint, the Touch ID utilizes a color-matched steel ring that surrounds the sapphire glass lens. This highly scratch-resistant sapphire glass lens protects that assembly and focuses the sensor and the steel ring. The capacitive Touch ID sensor activates when the ring is triggered. It then takes a high-resolution snapshot of your fingerprint. The new fingerprint input is compared with the ones stored in the secure domain on the processor. If they match, Touch ID will instantly authenticate access and unlock the iPhone. Purchases and access to certain apps are also authenticated and authorized. But if the fingerprints don’t match, Touch ID does the opposite or denies access to the device. Touch ID uses the data it acquires every time it it scans your fingerprint. These data will be used to improve recognition for it to work more consistently from more angles over time. In order to get started, you will need to set up Touch ID on your iPhone 7. You will need the passcode for your device before you can proceed with the Touch ID setup. If necessary, create or set a passcode on your iPhone 7 by going to Settings-> Touch ID & Passcode-> then tap the option to Turn Passcode On. Proceed by entering a six-digit passcode or tap Passcode Options to switch to a four-digit numeric code. You can set a custom numeric code or a custom alphanumeric code for your passcode. Enter the same passcode again to confirm and activate it. Tap the option to Add a Fingerprint. Hold your iPhone as you normally would while touching the Home button with your finger. Be sure not to press the Home button. Just hold it there until you feel a quick vibration or when you’re prompted to lift your finger. Continue to lift your finger and then rest your finger slowly. Make small adjustments to your finger’s position each time you touch the Home button. If you’re prompted to adjust your grip, hold your iPhone as you normally would when unlocking it and then touch the Home button with the outer areas of your fingertip instead of the center portion that you scanned first. Go to Settings-> Touch ID & Passcode menu. Once you get to this section, you may configure any of the following options based on your preferences. To enable or disable Touch ID for Passcode, iTunes & App Store, or Apple Pay, simply toggle the switch next to each of these options as you prefer. To enroll or register more fingerprints, follow the same steps when you register your first fingerprint. You can enroll up to five fingerprints. The next fingerprint recognition process can take slightly longer. Thus, you may need to be a bit patient. To rename a fingerprint, tap on the desired fingerprint and then enter a desired name. To delete a fingerprint, swipe the desired fingerprint. To identify a fingerprint in the list, touch the Home button. Doing so will highlight the matching print briefly. Once you’re fingerprint is registered, you can now start using Touch ID to unlock your iPhone, make purchases or pay for Apple Pay purchases. 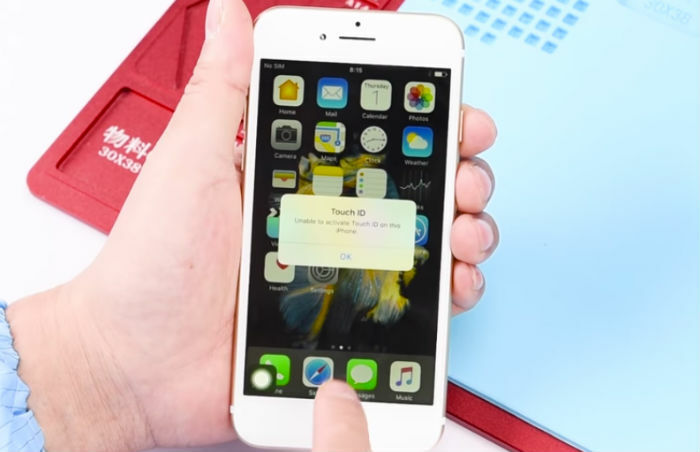 Instead of entering a passcode, you can use Touch ID to unlock your iPhone. Just press the Home button using the finger you have registered with Touch ID and once it matches the ones stored in the iPhone’s secure domain, access is granted. Go to Settings-> Touch ID & Passcode-> and make sure iTunes & App Store is turned on. Otherwise, go to Settings-> iTunes & App Store and then enable it from there. Next, open the iTunes Store, iBooks Store, or App Store. Tap on the item you want to buy. A Touch ID prompt will appear. To make a purchase, lightly touch the Home button with the registered finger and to authenticate and authorize purchase. Do the same when making Apple Pay purchases in stores, within apps, and on websites in Safari using Touch ID. Apple Pay allows you to make in-store and online purchases with your iPhone. With Touch ID these transactions can be done with much ease and convenient. All you need is a scan of your fingerprint and once when the print matches, credit and debit card purchases should go through. What to do if you cannot enroll a fingerprint, cannot unlock your iPhone or prompted to enter your passcode when using Touch ID? There are times when Touch ID doesn’t seem to work as intended on your iPhone 7. Should that happen to you, here are a few workarounds you can try on. Be sure to test the Touch ID after completing each step to determine whether it’s already fixed. Proceed to the next applicable solution, if necessary. Verify and ensure that your iPhone 7 runs the latest iOS version. To check the current iOS version or available updates, go to Settings-> General-> Software Update. If an update is available and you would want to proceed, tap the option to Download and Install then follow the onscreen instructions to download and install new iOS update on your device. Be sure to back up your iPhone beforehand for safekeeping purposes. Check and ensure that your fingers and the Home button are clean and dry. If necessary, you can clean the Home button using a clean, lint-free cloth to wipe off any dirt or debris. When positioning your finger, make sure that your finger does not cover the Home button completely. Touch the surrounding metal ring and do not tap too quickly or move your finger around while Touch ID is scanning. If you are using a case or screen protector, make sure it does not cover the Home button or surrounding ring. You can remove the case or screen protector temporarily and then try using the Touch ID again without any of the said accessories. Make sure that iPhone Unlock or iTunes & App Store is enabled on your device. To do so, head over to Settings-> Touch ID & Passcode. If necessary, toggle the switch to enable the feature. Also make sure that you have enrolled one or more fingerprints. Try enrolling a different finger, if necessary. Reboot your iPhone 7 then try to use Touch ID again to unlock it. If the problem persists and the Touch ID still does not work on your iPhone, contact Apple Support to escalate the problem or take your iPhone 7 to an Apple Retail Store or Authorized Service Center to have the Touch ID or physical Home button checked for any possible signs of damage. A physical or liquid damage on the Home button can be the main reason as to why Touch ID does not work on your iPhone 7.